As with the knee and shoulder, is typically performed to treat end stage arthritis. There are various forms of the procedure, which we’ll discuss. It’s performed a bit different than a knee, but the general principles are always the same. As was mentioned in the section on knee replacements, this procedure involves the re-surfacing of joint surfaces, but with one exception; In the traditional hip arthroplasty (replacement) procedure, the degenerated femoral head (ball of the hip) is indeed removed to make way for the insertion of the hip “stem” to which a metallic or ceramic ball (femoral head) is attached. 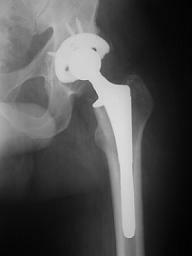 The image below shows what a hip replacement looks on an x-ray, after the procedure has been completed. Because the metals are very hard and dense material, they show up "white" on x-rays due to inability of the x-ray "beam" to penetrate the metal. 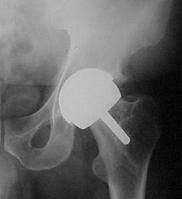 Below, you will see a picture of what one particular brand of hip replacement components looks like. Notice the rough, "gritty" coating surrounding the upper portion of the "stem" (the part which fits into the femoral, or thigh bone, canal). This is what is known as a "porous" coating which stimulates the patient's onw body to literally "heal itself" to the implant. There are other procedures in which the femoral head is actually shaved down to a particular shape to accommodate a “cap” over the bone. This is known as a Hip Resurfacing procedure. 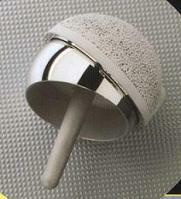 One example of hip resurfacing is the Birmingham Hip resurfacing implants. Images of these implants are seen below. The components necessary for the standard type of procedure consists of (1) the acetabular “shell” or “cup” (socket), (2) the femoral stem (inserted down the canal of the thigh bone), (3) the modular (interchangeable) femoral head and (3) the cup “liner”. OK. Let’s talk about the traditional total hip replacement. The procedure consists of gaining entry to the hip joint surgically, using one of many approaches. 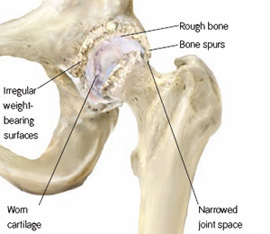 Once the hip joint is properly exposed, the hip is actually “dislocated” to expose the femoral head. At this point the ball is removed using a surgical saw and the acetabulum (socket) is exposed. The removed femoral head is “sized” to get an idea of how big the replacement cup should be. By now it has been determined whether to cement the cup in or not, and the vast majority do not cement the cup anymore, opting instead for the “press-fit” alternative. Using a series of reaming devices that look like cheese graters, the cup is cleaned of all its remaining joint cartilage down to raw bone, as this promotes the best fit and healing to the implant. Once this is done, the femur (thigh bone) is dealt with. Using a variety of cutting, shaping and reaming tools, the bone is precisely “hollowed out” to accommodate the stem implant. These, too, come in cemented and press-fit versions. After trial fittings and “dry runs” with temporary implants, the final ones are selected and put into place. Remember the section; Knee Replacement? We discussed that the parts consisted of metal and plastic. In general, the same holds true in the hip, though now there are significantly more varieties of “spacers” and materials to use between the ball and cup. Examples include high density plastic, ceramic coating, and metal-on-metal combinations. however the femoral head is not removed, rather it is "milled" into a shape that allows it to be "capped" much like a tooth. Resurfacing procedures are typically performed on younger patients because the femoral neck and canal are not violated in the event future procedures become necessary.